Using blogs since 2008. He begins writing articles motivated by his interest in debates and conferences about Freedom of the Press. 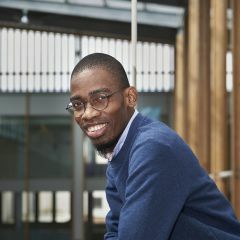 His first article was published in Jornal Notícias (Mozambique) in 2012, and in 2013 – began writing for other national and international newspapers as well. He joined in 2013 the ‘Olho do Cidadão’ – citizen's movement in Mozambique, constituted by a Platform of Bloggers who exercise their citizenship through the Citizen-Journalist concept, reporting, photographing and intervening in the problems of their society. Master in Political Science at the University of Bordeaux (Sciences Po Bordeaux) in France, he is (now) PhD Candidate in Political Science at the same Univeristy. Many reactions were observed on social media, some in support of the immigrants and others who think the police's handling of the situation was appropriate.